Good news, you’ve just won a free trip to Miami. The flight leaves tonight, so pack your bags and get to the airport. You’ve never flown before? Don’t worry about that, you’ll be fine; millions of people fly every year without any problems. Flying is a very simple process, before you know it we will have landed in Miami. Let’s start by checking in our bags at the counter. Now that we’ve got our tickets, lets go check in to security. Security in Brazilian airports isn’t as bad as it is in US airports where they make you take off your shoes and walk through machines that can see you naked. We need to empty our pockets into the tray, and send our bags through the x-ray machine. Then we need to walk through the metal detector. The Transportation Security Administration (TSA) is responsible for security in US airports. All passengers flying out of US airports must go through a pat down or x-ray machine. We are through the security checkpoint, now we can get something to eat before the plane leaves. I’m just going to get a drink of water and I’ll meet you at the gate. “Ladies and gentlemen, American Airlines flight 815 to Miami is now ready to board. Please proceed to gate 15 at this time.” It’s time to go! “We will now begin boarding rows 30-40.” We are in row 31, lets go get in line. “Next in line!” That’s us. “Boarding pass please… Have a nice flight.” That was easy. Lets go get on the plane and find our seats. There is always a line to get on the plane because so many people are trying to go through a small space. When we get to the front of the line the flight attendants are going to direct us to our seats. Once everybody has taken their seats they will show us a safety video. Once we’re up in the air the flight attendants will come by with drinks and snacks. They will also give us papers that we will need to fill out in order to gain entrance to the US. I’m going to take a nap now. Wake me up when we land in Miami. Wow, that was fast. Now that we’ve landed we have to go through immigration. You have to go through this alone and I’ll be waiting on the other side when you’re done. You do know how to speak English, right? Ok, good, it’s your turn so step up to that window right there. “Passport please,” says the agent behind the counter. “Here,” you say as you hand your passport to the man. That wasn’t so bad, was it? We’re not done yet, now we have to go grab our bags and take them through customs before we can leave the airport. Let’s go to the baggage claim and find our suitcases. “Next!” yells the customs agent. Its your turn. “Customs card please,” says the agent to you. “Oh yes, here it is,” you say as you give the card to the woman. That was easy, wasn’t it? Now we can go enjoy all of the things that Miami has to offer. We’re going to have so much fun, and before you know it the trip will be over and we will be back here at the airport. Enjoy your trip, and remember to buy iPads for all of your friends back home who want them. Now that you have a new stamp in your passport, its time to apply for the Real Life English passport. Sign up to our mailing list in order to get your Real Life English passport to the world. Have you ever traveled on an international flight? 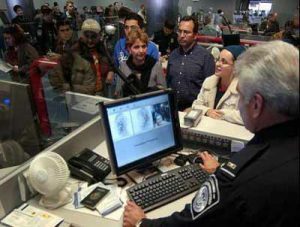 What kind of questions did the immigration and customs authorities ask you? 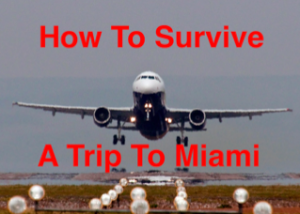 Great article to give a quick read before your light to the most latin city of the U.S.
No one sleeps during the entire flight nor gets a free trip to Miami. But okay this article is very complete, basically all the questions they may ask are listed here. It is helpful for the ones who have already travelled and for the ones who haven't yet. “Did you pack your own suitcase? Have you left it unattended since you packed it?”. “I packed it myself and it has been with me the whole time.”. If they asked me I would not understand, that is nice I got to read this and won't have problems with this in the future. I like the fact that the four of you always find a way to link what you are writing with Real Life English community. And there is the version of the article both in English and Portuguese-Brazilian. Very helpful to everyone !